Winter Travel Outfits for women- When planning a trip during your winter holidays, all you really desire is to look super cool while keeping it cool. It is justified if you plan to travel for some sunny weather and relaxing beach shores in order to avoid the cool scorching breeze of winters but you also want to pack smartly and precisely. Make sure you have some idea regarding the expected temperature fall, and if you are sensitive to extremely low temperatures then make sure you’re packing your big, warm and cozy coat with you to protect you against extreme weather. Packing for any weather is an art because you have to utilize your aesthetic sense to mix and match the best way you can. Packing a warm yet super fashionable wardrobe for you is one kind of a challenge but you can definitely excel in it through some research. The article is a complete guide for travel clothing with some of the best combos and unique dressing ideas you can adopt while boarding your luxe destination. It will make your life easier by providing you with some super classy attires which will go perfectly with the fall charms. If you’re planning a short trip like that of 3-4 days, then packing precisely is a good option; as there is no need to pack unnecessary goodies with you. 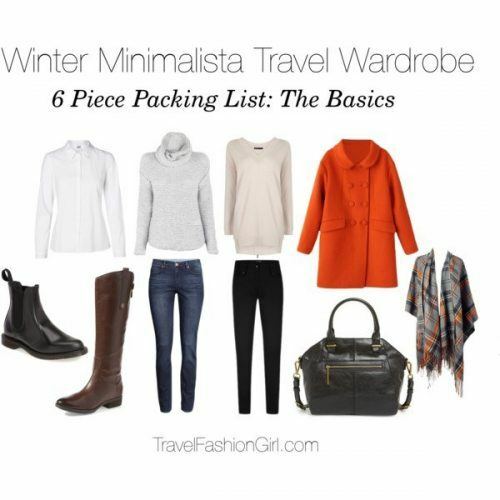 Try to pack two to three sweater tops and a stylish neutral color oversized jacket. A pair of skinny jeans and your ever favorite charming ankle booties will do the job. Wanna travel around Paris in French girl attire, go for a chic denim button-down top and black denim pants. Flat pumps will be perfect keeping in mind the Riviera look. Don’t forget to bring a short fur jacket with you. Accessories are essential when it comes to traveling, especially when you’re putting on a deep v-neck sweater or a cropped sweater. Although chokers and long chains look perfect for a casual look, however, vintage jewelry is always a better option in order to enhance the charm of the ensemble. Just like Hailey Balwin, you can rock some super Boho cropped hoodies while traveling. These are available in various style, printed as well as plain. If you’re a funk lover, go for the printed ones. There are comfy for long hours on a plain and super casual if worn with sweatpants. Fall and leather pants go hand in hand. An enlarged sweatshirt along with some sassy skinny leather pants and ankle boots, you can have that cool lady look while traveling. Just like Gigi, you can opt for athleisure style dress-up for traveling as it is the comfiest option for those who want to keep it humble yet cool. Go for some sweatpants, pastels preferably with matching cropped hoodies. You can also add a bomber jacket to this ensemble to highlight your travel look. Sneakers are the comfiest and most fashionable option for traveling these days. If you’re planning to travel to areas where the temperature falls to normal levels of cold, then sneakers will do the job. In case you are anticipating the weather to get lower than normal levels, always keep a pair of hard shoes like long boots with you, which will protect you from fall precipitation. Huge bomber jackets and jeans will look fantastic during such frosty weather. Oversized scarves look extremely stylish as these items always add to your style statement. While traveling during winters, you can wrap an enlarged printed scarf around your neck, covering your casual and simple top and enhancing your ensemble. You can dress in your favorite leather jacket and pants on the airport with a sling bag and sassy ankle boots. The style is gonna make you look no less than a celeb without making you step out of your comfort zone. Cozy and soft furs are your best option to travel in as these will make you miss your plush pillows a bit lesser on during wander. For those who always find an all-black ensemble, the comfiest can go for a black top with black jeans. A black patterned jacket and embroidered heeled boots will go perfectly during fall. Fleece lined tights and leggings are essential if you have got sick of going around wearing jeans everywhere. Wear them with thigh-long fitted sweaters and block heel boots. ↓14- How to Layer Collar Top for Traveling? Wear a baggy knitted sweater in a lighter shade like beige or off-white over your collar shirt and go for knee-length boots simply. Slim and comfy turtleneck thigh-long knitted tops are any fashionista’s favorite item which can be paired with a pair of blue jeans or black tights and a simple patterned scarf will definitely enhance it. ↓12- How to Highlight Coats? You want your coat to be the center of attention, then wear it with a neutral color sweatshirt and plain denim. Add a sling chain strap bag which is stylish enough to bring attention towards the coat you spent hundreds of dollars on. Hats are considered to be a must while traveling as these are way different from your day to day attire and make you look more classy and super retro. Goggles will help you from keeping the sun from hurting your eyes and will complete your travel look, let it be summers or winters. If you’re planning to wear oversized sweatshirts or sweaters, then glamorous and bright colored thigh-high boots will highlight your travel style. If you want a funky look for traveling, then simply pair a plain top with a velvety colored skirt and a printed scarf which will make your attire super funky. Knitted dresses in casual prints like gingham and florals can be worn with blazers and boots by women who are 30 plus and like to dress modestly. If you don’t want to layer multiple garments, simply wear some boot-cut denim pants with a baggy sweater and sneakers. Onesies’ lovers can wear a black or charcoal onesie with a fur jacket and joggers while traveling. ↓4- How to Wear Mufflers? A pale colored knitted muffler always look fashionable during traveling. Capes can be worn with stylish leather boots while traveling and these are the most trendy garments during fall. Metallic lipsticks are not the only trending items these days but metallic jackets as well, since these can glam up any winter silhouette. Embroidered denim jackets with denim skinny pants or skirts is a catchy style for traveling for young girls. Wear them with simple white sneakers to keep the look Bohemian. An economics student who has a keen interest in the latest trends revolving in the world of fashion and glamor. She loves to analyze the trending haute couture and use her aesthetics and creativity to help you dress the best. Thank you for sharing these travel outfits. You need to be comfortable for long flights, and must also plan for a weather change. Are you serious? You imagine to take off those overknee boots at the security control? OR taking off the jumpsuit in the plane’s toilet?